Aug 30 By Jen 35 Comments This post may contain affiliate links. A simple brownie recipe made entirely in the food processor and using a whole can of black beans…who would have thought the result would be fudgey and delicious?! 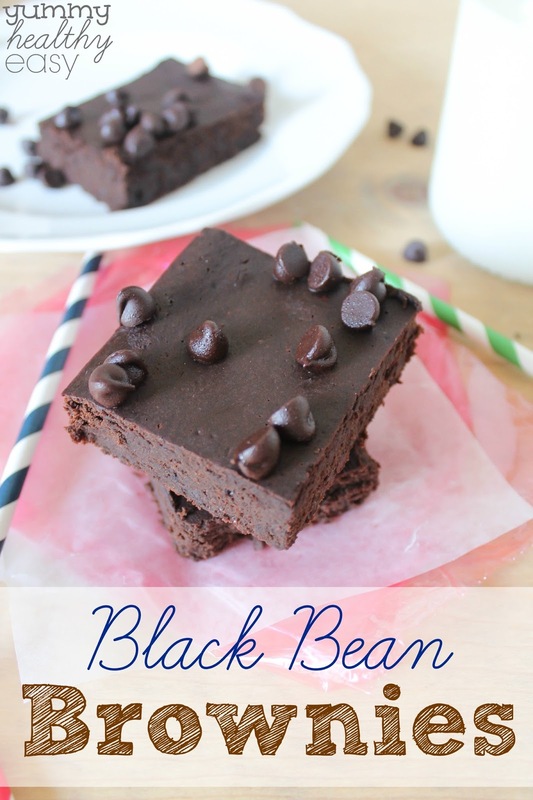 If you’re watching your calories, you’re going to love these Black Bean Brownies! If I was on my death bed and I could only choose one dessert before my final breath, I would choose a fudgey, rich, chocolatey brownie. They are my fave. I am a huge chocolate fan and brownies just hit the spot for me. 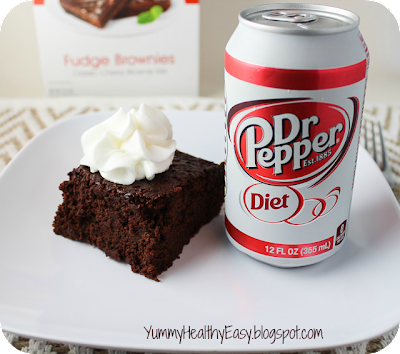 So what if I told you that you could make a pan of brownies using a can of black beans and a few other ingredients? Would you believe me? Well, you best be believing. I was skeptical, too. I mean, beans? Really? 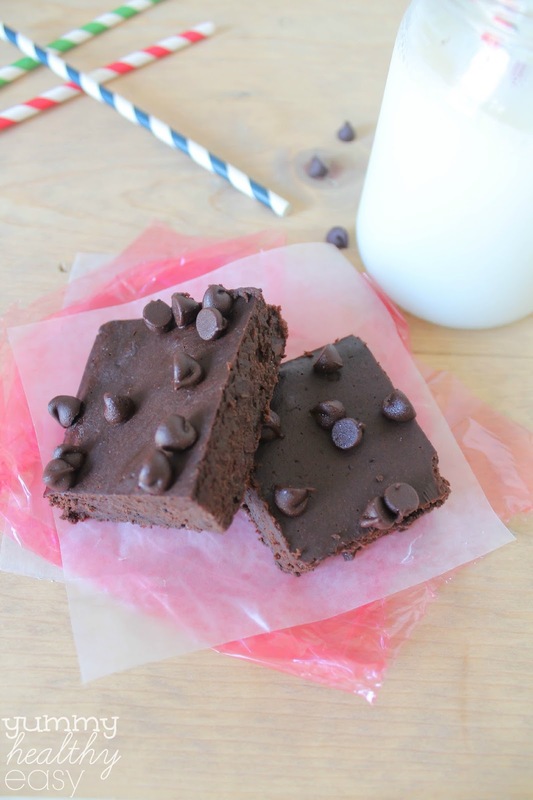 These brownies use an entire can of black beans and are completely free of flour! The result is a densely rich, chocolate fudgey, lower calorie, higher fiber & higher protein brownie! Seriously these are pretty dang good. If you’re watching your calories, give these a try for a treat. Let me know what you think! 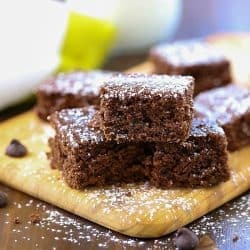 A simple brownie recipe made entirely in the food processor and using a whole can of black beans. Preheat oven to 350º. 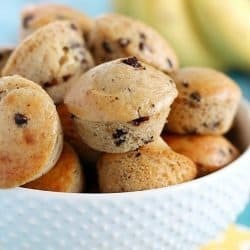 In a food processor, combine the beans, chocolate chips and oil. Blend until combined. Add the eggs, brown sugar, cocoa, vanilla, baking powder and salt; cover and process until smooth. Transfer to a 9x9 square baking pan coated with cooking spray. Bake for 20-25 minutes or until a toothpick inserted near the center comes out clean. Sprinkle with extra chocolate chips, if desired and cool on a wire rack. Cut into bars and enjoy! 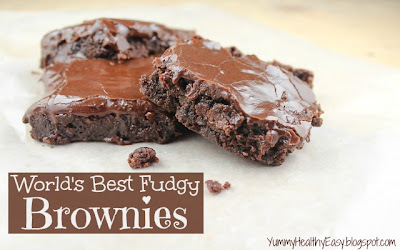 I have never made black bean brownies, but I wouldn’t mind trying them. 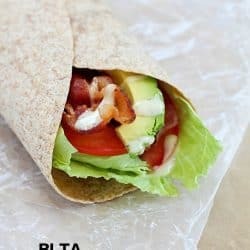 It’s always good to find a recipe that is a healthier alternative to what you usually eat. 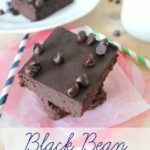 I’ve always been hesitant to try black bean brownies again! I had them once and didn’t like them but you make them look good! 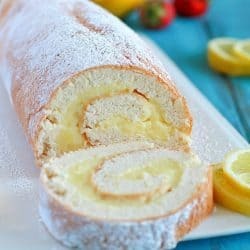 I’ve made something like this before and they were delicious! I think next time I am going to peel the beans (so tedious) because mine still had some skins in them. I’ve heard of people making brownies with beans but have never tried it. After seeing your pictures, I think I had better give it a try! I have had these. 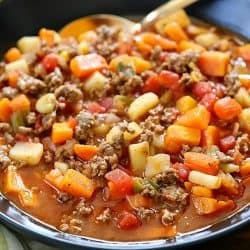 I just can’t get it out of my mind that there are beans in there! Lol. But they were good. Thanks for sharing at Sweet & Savory Saturdays #28. I’ve been curious, but chicken, to try black bean brownies. 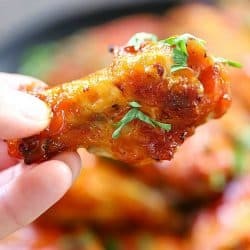 Thanks for sharing your recipe- I think I’ll try them soon! Soooooo . . . if they are made with black beans, that means I can eat an entire pan, right?? 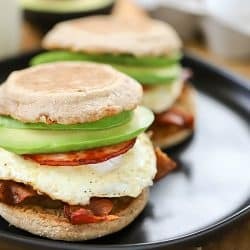 Thank you for linking up with Wake Up Wednesdays, Jen!! 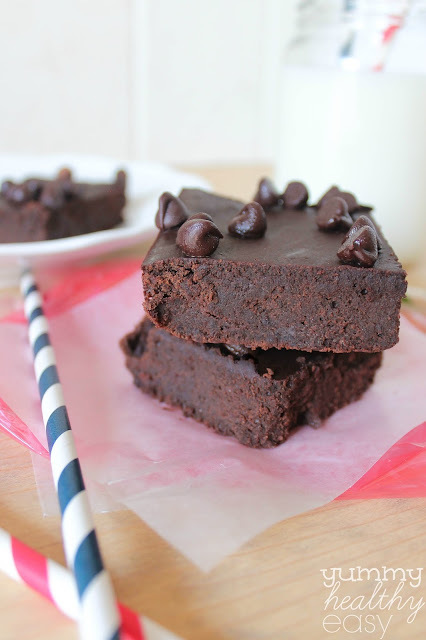 I love black bean brownies and the chocolate chips on top of yours are a nice touch. 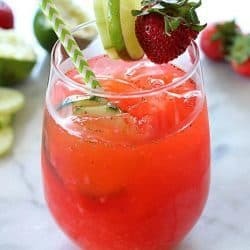 I a going to try this recipe very soon! This is a new one to me. I’ve never heard of Black Bean Brownies, but I’d love to try them! Pinned! 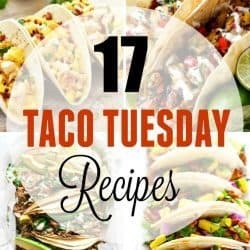 I’d be honored if you linked these up to our All Things Thursday Blog Hop going on right now. Links are randomized, so still plenty of exposure time. I hope to see you and your brownies there! Can I use Coconut Oil instead of the Canola Oil? I am not a fan of Canola… not the healthiest of oils 🙂 Please let me know since I am holding the can of beans in my hand and am drooling for a chocolate fix. Mmmmm……..
I’m sure you can, Chrissy! 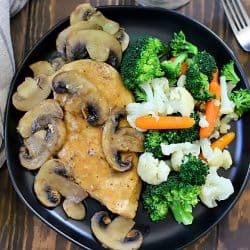 I’m with you, lately I have LOVED using coconut oil and I’m sure you can replace the canola with coconut in this recipe! Let me know what you think after you make them! 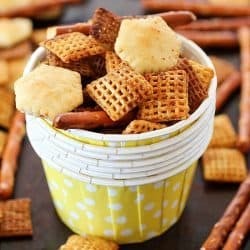 I don’t know if I over-looked it, but do you know where I can get the Nutrition Info on these? I’m doing a weight loss competition with some girls at work and I need a more healthy dessert I can enjoy but tastes good. 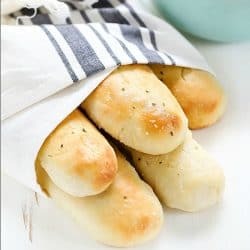 They look soooo good in the picture that I’m making them this weekend to try. I’ve got this pinned on Pinterest. 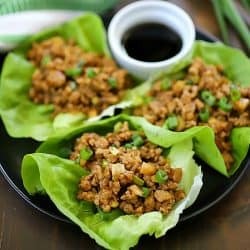 These were a HUGE Hit! 4 out of 6 people in our house LOVED THEM! the other two people one my picky husband said there ok and the other one says it’s way to chocolately. LOVE THEM! 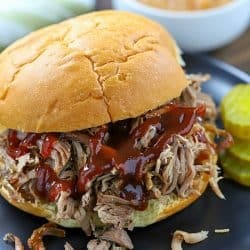 Thanks for sharing a great recipe so happy to find one that tastes delicious! The only other thing I wish was you showing the nutritional facts on it. Although I did plug it in the sparkrecipes.com for some sort of reference. Thanks again for the Awesome Brownie! What did you get for the nutritional information? Hi Melissa! I just updated the recipe for Black Bean Brownies with the nutritional info. Thanks!! YAY!! I’m so happy they were a hit! Not bad for a healthy dessert, right?! I would love to try the black bean brownies, however when people asked about the nutritional values, no one gave an answer to the question. Please could you tell us the nutritional values. Hi Carol! 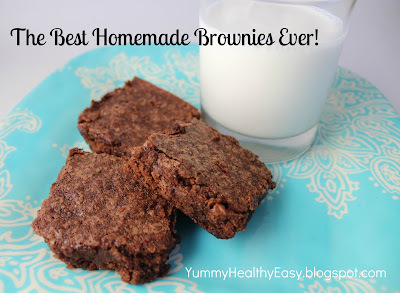 I just updated the recipe for these Black Bean Brownies with the nutritional info! Thanks! Amazing. U have been sneaking theses into my mans lunch and he raves about them!! Doesn’t even know why they are so delish and moist!! What a surprise that was! Hi I just made these brownies and while I haven’t tasted them yet they look and smell delicious!!!!!! I saw a lot of comments about calorie breakdown so here it is!!!!!!!! I used a 9×9 pan like the recipe called for and I did use an extra 1/4 cup of chocolate chips on top…….so if you cut the pan to 9 square brownies the calories are about 230 per piece 🙂 hope this helps ENJOY!!!!!! !